property from fire and harm through continuous fire prevention, education, code enforcement, emergency, and non-emergency services. Over the past few years the department has experienced several operational changes including; the transfer of it’s dispatching arrangement to the county’s Emergency 9-1-1 Communications Center, the implementation of the Incident Command System at fire incidents, the creation of a tactical rescue team, the enforcement of the state’s Uniform Fire Code by on duty paid personnel, and probably most important, aggressive promotion of fire prevention and fire safety in the community. 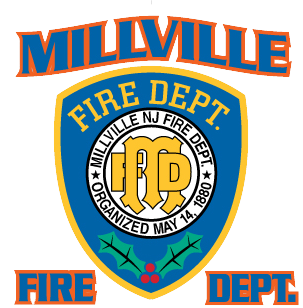 Today, the Millville Fire Department has forty-two members. Of that number, there are eleven full-time career firefighters, three captains and chief. The career staff is then supplemented by the volunteer members. The company operates three engines, two ladders, a rescue/cascade truck, a brush truck, two utility trucks, a Tactical Rescue trailer, Haz-Mat Decon trailer, four rescue boats, a foam operations trailer and fire investigation vehicle. The company also has a state of the art Fire Prevention Trailer that is set up as a two story house with operating smoke detectors and heated bedroom door and smoke simulation.